The Limeliters - Then & Now! The "Hungry-I" in San Francisco was packed that night in 1959 to hear the sensational new folk trio whose reputation had preceded them from a small club in Aspen called The Limelite. The Limeliters are still thrilling audiences with their surging vocals and ironic wit 55 years later! This website celebrates over 50 years history of this dynamic folk trio. In 2006, after 47 years of entertaining around the world as a Limeliters®, founding member, Alex Hassilev retired. Over the years, Alex's uniquely rich baritone voice has been the venerable cornerstone of the signature Limeliters® sound. Alex held a very high standard for this sound from its conception in 1959 to the present. He established a long neck banjo style that inspired many folk musicians and crossed ethnic boundaries to perform songs in Russian, Yiddish, Portuguese, Spanish and French. You can still buy most of The Limeliters historic albums! In a January 2019 concert in Austin, Texas, Rich Dougherty (left) performed with Andy Corwin and Steve Brooks as a temporarily re-configured Limeliters group. After Alex's retirement, beginning in mid-2006 through 2013, Andy Corwin, Mack Bailey and Gaylan Taylor, began carrying on the Limeliters® name and tradition that began in 1959. Don Marovich replaced Mack Bailey in 2013. Steve Brooks replaced Gaylan Taylor in August, 2018. 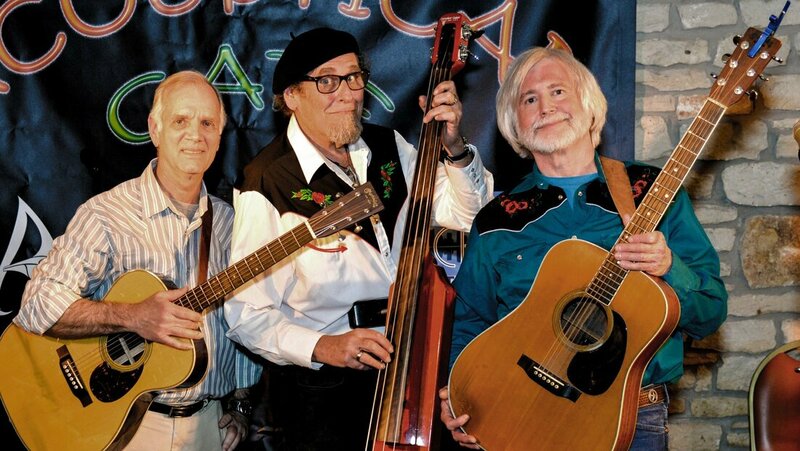 On 11 January 2019, Don Marovich announced that he was leaving The Limeliters in order to join The Kingston Trio. The remaining members commented, that they are "extremely happy for him and fully support his decision to pursue this opportunity." The group is currently looking for a permanent replacement (to sing tenor & play banjo) but, in the interim, they were delighted that former Limeliter, Rick Dougherty is able to pinch-hit!. Rick was a member of the Limeliters from 1990 to 2003 (and then, a member of The Kingston Trio from 2004 to 2017). Perhaps precise membership is no longer that crucial in a folk group that still retains its signature sound from long ago, despite many changed in "personnel." Future concerts planned by The Limeliters including one with George Grove (Rick's longtime bandmate in The Kingston Trio), and another with The Brothers Four. With different configurations over the years, the group has preserved their signature vocal sound and continues to earn their name as The Fabulous Limeliters. Former Limeliters Red Grammer, and Mack Bailey still perform in solo careers. Former Limeliters Rick Dougherty and Bill Zorn until recently performed with the Kingston Trio, and then Rick, George Grove, and Jerry Siggins now perform with a new group "The Folk Legends" - renamed in late 2018 as "The Folk Legacy Trio." Rick also performs solo, and appears as a guest with The Limeliters from time to time. Founding member Alex Hassilev celebrated his 85th birthday on July 11, 2017. He will occasionally come up to join the current line-up to perform "Gari Gari"! Founding member Lou Gottlieb died in 1996. Founding member Glenn Yarbrough died in 2016. Explore the tabs and drop-down menus above to learn more about the Fabulous Limeliters! New! Buy The Limeliters' latest albums Pass the Music On and Right from the Start via cdbaby.com.